Mijn vijftigste blog verhaal, nadat ik 100 dagen in Indonesi? heb verbleven. Dit is mijn 50ste weblog verhaal. Per vandaag zit ik precies 100 dagen in de republiek van Indonesië. Het is nu half één 's nachts en ik ga slapen zodra ik dit verhaal heb afgemaakt. Eindelijk is het voor mij mogelijk om te internetten in mijn koswoning. Ik heb een hardware onderdeel met USB aansluiting gekocht dat overal verbinding kan maken met satelliet. Echt geweldig! Achter in de taxi zitten met je laptop op schoot en draadloos internet via de indoSat. Morgenvroeg heb ik de afsluitende vergadering met de Indonesian Netherlands Assocation, voor hen heb ik een geheel nieuwe website gebouwd met achterliggende Content Management Systeem (CMS). Tijdens de meeting ga ik de applicatie installeren op hun server en locale intronet, daarnaast ga ik de medewerkers een cursus geven hoe ze de nieuwe applicatie kunnen gebruiken. Ik heb net weer een stroomuitval gehad van een halfuur ('mati lampu'), echt zo'n moment waarop de kaarsjes worden aangestoken. Overal in de regio van Pondok Gede is het pikkedonker in elk huis, behalve in die ene kos, want daar zit dhr. Corba met zijn vijf brandende kaarsen een laptop en internet. Internet bij kaarslicht en ik begin een chatsessie van twee uur met mijn ouders in Arnhem. Meteen even een rondleiding gegeven. Nog 58 dagen en dan gaat mijn reis verder in mijn land van herkomst. This is my 50th weblog story. This is the 100th day I am residing in Republic Indonesia. Right now it's a half past midnight and once I'm finished writing this piece I'm going to sleep right away. Finally it's possible for me to surf the web from my little house. I have bought a piece of hardware with connects your computer (through USB) with a satellite. It's fantastic! Sittin' in the back of a taxi, havin' a notebook on your lap and using wireless internet of indoSat. 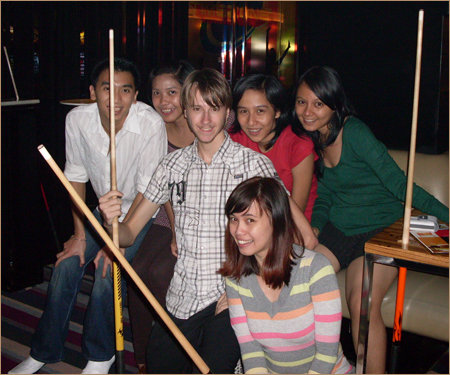 This is a great group of friends (picture in Dutch section) who Anggie and me are hanging out with. We are going to have dinner together, watch a film in the theater are we play some pool. Under me, to the right is Vicy: one of Anggie's best friends. All the way to the left is Lucky: hij studied in Canada en is now living there. Once in a while he returns to Indonesia to keep in touch with his friends. Anggie, for those who do not recognize my girlfriend yet, is sittin' to the left of me. Tomorrow morning I have a meeting with the Indonesian Netherlands Association. I have created a complete new website with Content Management System (CMS) and tomorrow I wil install this on their server and local intranet, after that I will give a short course to the employes 'how' to use this new application. Recently I've encountered another power failure ('mati lampu') that lasted half an hour. At a moment like this, the candles will be lit. Everywhere in Pondok Gede there is no light to see, except for that little hous where mr. Corba is siiting with five candles, a notebook and internet. Surfing the web at candle light and I start a chat session with my parents for two hours. Of course, I gave them a sightseeing tour by webcam since they have never seen my house before. Only 58 days remains before I continue my journey in my native country.